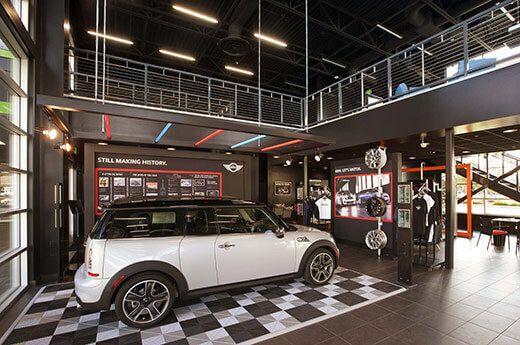 The new Mini of Reno auto dealership is an 11,339 SF visual head turning, need a second look project. The building is very functional and houses the parts, service and sales department as well as the showroom. The showroom features a unique double-plat vehicle lift to move the cars to the second floor showroom. As an added safety feature in the service department a high speed glass garage door with built in sensors was installed. 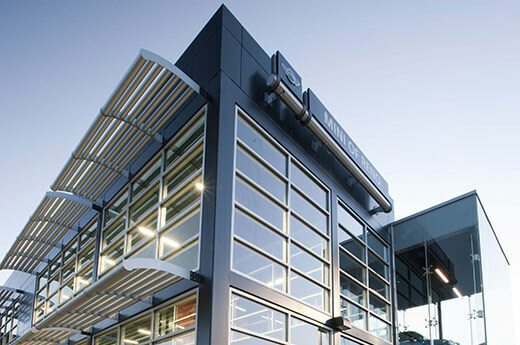 Exterior features include exposed cinder blocks, structural glazing and aluminum composite metal wall panels. There were several challenges primarily for the contractor on this project. 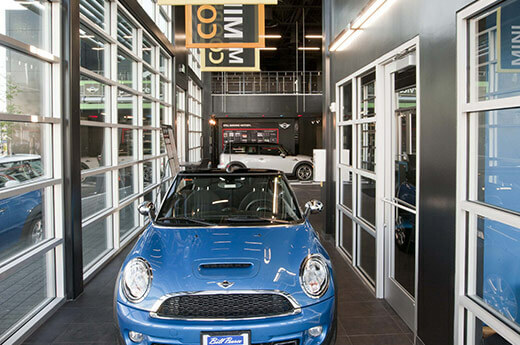 Mini of Reno was constructed on a very small existing lot adjacent to the BMW dealership. There was no interruption to the owner during construction. Electricity, site traffic, noise – was all kept to an absolute minimum and all the subcontractors working on site were very respectful to the owner of BMW and of the site conditions they had to work under. Additionally, the staging area for the subcontractors was approximately a mile from the site. The owner approved this project in late November. A significant portion of the building material was cinder blocks, however, the manufacturing plant was closed in December and the block was not available until February. From February 1st to March 31st, the Reno Tahoe area had the worst winter on record and received 30 feet of snow! It was one of the largest and longest winters this area has seen. The project was fast paced to meet contract deadlines, structural steel was pushed ahead of masonry and the construction process was juggled to work around long-lead items such as structural glazing and ACM Panels. This required constant interaction and communication between subcontractors and GC oversight, Alston Construction rallied the subcontractors, reworked construction schedules and contacted material vendors to meet the deadlines. All subcontractors worked, nights and weekends to ensure the project was completed on time and quality was not sacrificed despite the accelerated schedule. There were several owner provided systems—sound system, furnishings, shop equipment, car lift—that had a separate contractor. These specialty items required close coordination and open dialogue with both the design team and the general contractor. The project is unique in that it was a hard bid project and was value engineered after it was awarded. With savings, a contingency was established and managed throughout the project duration. At the end of the project the owner was given back the remaining savings, 1% of the original contract amount. This building is a very complex, small building. It is intricately designed and detailed much like the Mini Cooper. It is very simple, modern in look. Yet the design to make it look so sleek and simple is quite sophisticated. It is unusual in that it is a two story showroom. This building follows “Mini USA” standards and criteria. It is anything but standard. It has floor-to-ceiling glass on three sides. The interior is painted with flat black paint and has elongated 11 X 17 grey floor tiles. Couple this with stainless steel hardware, contemporary lighting, colorful furniture and the building creates a statement of “cool”. 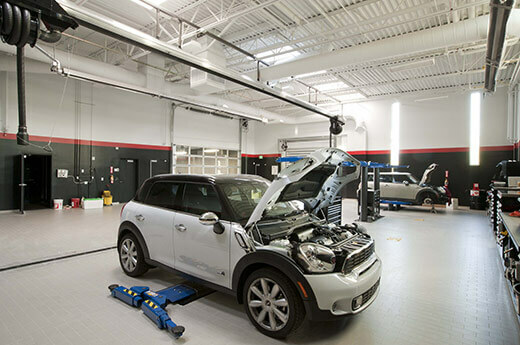 It helps that there are also Mini Coopers throughout the building and a stainless steel car lift to get the Mini’s to the second level showcase, the “jewel box”. The building is very functional housing the parts, service and sales departments as well as the showroom. The service department has a high speed glass garage door with a built in sensor. So, anytime a car gets within a certain distance, the sensor raises and then closes the garage door. Each piece of glass weighs 800 pounds. The brackets for the glass panels are stainless steel and very minimal. The glass contractor had to be on top of his game. The light fixtures and wall finishes are all black which made a superior level of quality more difficult to achieve. This set the building apart right away. Most building interiors are not all black. There are several exterior finishes that the contractor went above and beyond in technique that added an element of uniqueness to the building. The finish quality was difficult to achieve – it is a Level 5 smooth wall finish. It is an unforgiving finish and so careful attention to detail was given. Other unique elements included custom made black CMU, black exterior ACM panels, which had a long lead time and were very difficult to measure. Alston Construction asked the manufacturer to measure them in the field which cut a significant portion of the lead time. The second floor “jewel box” consisted of structural glass walls and a double platform lift. The Project was completed under budget using value engineering and managing costs, the project was completed within contract deadlines despite the worst winter on record by accelerating the contract schedule. Mini is all about image. Having a showcase building that is just as attractive as the cars is a natural step. Mini is true to its branding in consistency. It is a small, complex car that is well organized, highly detailed and simple in style. The building stays true to the same design characteristics as the car.